A theologically-inclined evangelical friend of mine (who’s not United Methodist) linked to this post, “Giving up Hell for a Year: How it could revolutionize our relationships,” which struck me as a solution in search of a problem—or at least one that creates far more problems than it solves. Read it and tell me what you think. The United Methodist Church tried this around 1950, and every year since then. It’s been wildly successful as everyone knows. I’m sorry… The grass is always greener, I guess, but if one dislikes evangelicalism so much, there’s always mainline Protestantism. How about we resolve, instead, to tell the truth for one year, and see how that goes? This includes the truth about hell. People don’t go to hell because they fail to accept Christ; they go to hell because their sins have separated them from a holy God. This is humanity’s main problem. We are failing to tell the whole truth about the gospel if we omit that. So, no, I think the blogger’s idea is terrible. Brent, how do you think our view of hell impacts our ability to develop healthy, service-based relationships with others? If we love them with the agenda of “winning” them out of hell, what happens when it becomes clear they’re not going to budge? Do we sever the relationship? That seems to happen all too often. I think that’s a valid point the blogger makes. Jerry Walls, a United Methodist scholar now at Notre Dame Houston Baptist University (he was at Asbury), warns that we cannot write hell out of Christianity (again, as too many mainline Protestants have done) without fundamentally changing Christianity. 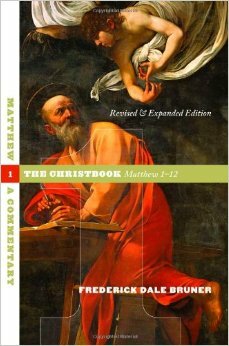 He argues that it does, in fact, change our mission and mute the urgency with which we do evangelism. If we’re promoting a caricature of the gospel, then let’s correct that caricature. But hell, as a doctrine, is by far the consensual teaching of two millennia of Christian thinking on the subject—whether hell is an everlasting state or annihilation. Walls is writing to an audience, including me, who have already been where this blogger wants us to go. Walls is telling us it doesn’t work. He gives us permission to take hell into consideration when we’re sharing the gospel. We ought to be concerned about people’s eternal destinies. Besides, where are all these Christians in America going around talking obsessively about hell? Where are all these Christians obsessed with winning non-Christians because they fear they’ll go to hell. I mean, I know they’re out there somewhere, but it hardly seems like the widespread problem this blogger makes it out to be. What does “as it is in heaven” mean? The expression “as in the heavens” teaches us that God has some kind of lively enterprise going on with angels and spirits and that the earth is not all there is to history (cf. 2 Kings 6). There is some kind of exciting invisible world at work in perfect obedience to God, where God’s name, kingdom, and will are treated with the respect they deserve. Moreover, this phrase asks us to believe that something like heavenly worship and obedience can also touch earth—the bold “as” permits us to think so. We are not to inquire too curiously about the nature of the heavenly activities; we are simply to pray that the name, kingdom, and will of the Father shall come to rights here on earth. In my sermon on Sunday, I dealt briefly with the age-old question, “Why does an all-good God allow evil and suffering?” In the interview I cited in my sermon, physicist Neil deGrasse Tyson seems to grant that God’s desire for human beings to have free will answers the question of human-made evil (which, indeed, accounts for most suffering in the world). But what about so-called “natural evil”—like natural disasters, pestilence, and disease—which seems to have little to do with human freedom? I say “little” because in a world free of sin, in which human beings are living in perfect harmony with God, with others, and with their own bodies, who knows how differently we could respond to these threats, granting that, in a pre-fallen world, they existed at all. Remember that humanity in the Garden of Evil wasn’t inherently immortal—at least according to most scholars. There was, rather, a tree of life of which they could avail themselves to enable them to live. Could it heal them of disease and injury? It seems likely. All that to say, given that spiritual warfare is our gravest threat in the world, I believe that the demonic realm can and does play an important and underappreciated (as in, hardly appreciated at all) role in creating or fostering natural evil. Even when Christian apologists tackle the question, I’ve rarely seen them resort to the devil as one explanation for evil. But why not? If we believe in Satan, evil, both human and natural, makes so much more sense! Michael Green, in his magisterial book I Believe in Satan’s Downfall, makes this point emphatically. What does it mean that the very first thing that Jesus teaches us to ask for in the Lord’s Prayer is that God’s name be hallowed? “Hallow” isn’t a word we use anymore, but as I say in this sermon, we all do it—whether we hallow God or something other than God. Jesus is telling us, among other things, that our priority in life is to praise, worship, and adore our heavenly Father. If this message is as challenging to you as it is to me, you’ll want to watch or read this sermon! A few years after Lisa and I got married, we saved money and bought a house in Tucker, Georgia. We were about a quarter-mile from the railroad tracks that ran through town. On our first night in our new house—in the middle of the night, around 2:00 in the morning—we were awakened abruptly by the sound of the train blaring its horn as it crossed a major road near our house. We could feel and hear the windows shake as it went through town. The next night it woke us up again, and the night after that, and the night after that. A couple of years later, a new neighbor moved in next door. I greeted him the morning after he moved in as he was on his way to work. “Oh, my gosh,” he said. “How do you sleep at night?” I’m like, “What are you talking about?” He said, “That train! It came through at two in the morning. It felt like an earthquake! And that whistle blaring!” And I remembered, “Oh, yeah! The train! I forgot all about that train! I haven’t noticed it in years. Somewhere along the way I stopped hearing it, stopped feeling it. I got used to it.” By the time my next-door neighbor moved in, I’d probably only wake up if it didn’t go through town in the middle of the night, blaring its horn! I’d gotten used to it. It became ordinary and commonplace. I stopped hearing it and feeling it. Yesterday’s sermon on the Lord’s Prayer dealt with the petitions, “Thy kingdom come, thy will be done on earth as it is in heaven.” My sermon ended up being mostly about God’s sovereignty. After all, we don’t pray, “God, what can we do to bring your kingdom to earth?” Or even, “God, how can we accomplish your will on earth?” We trust that God will ultimately see to both of those things, regardless of whatever role he wants us human beings to play in it. The inescapable conclusion—which so many Methodist clergy resist saying, for some reason—is that God is in control. But to say that God is in control is to risk being misunderstood. I referred to this recent interview with physicist Neil deGrasse Tyson, whose biggest objection to belief in God is human suffering. If God is in control (and good), and everything that happens is enfolded into God’s sovereign purposes, then he thinks that we theists must believe that everything that happens—even evil things—must somehow be good. He said he’s not willing to go there. And I’m not either. As I said in my sermon, there’s an important difference between God’s permitting evil and God’s causing it or approving of it. But we still have to deal with why God permits evil and suffering to occur. After all, we believe God has the power to grant our petitions in prayer. If we pray for God to give us something—even for God to enable us avoid suffering—and God doesn’t grant our petition, do we say that God is capricious in answering our prayers, or that God has his reasons? And if God has his reasons, we can only trust that those reasons are good—that he’s using our suffering for some good purpose. Daniel Kish is blind, yet he rides a bike. Daniel learned to do these things because, for whatever reason, his mother wasn’t afraid to let him get hurt—she wasn’t afraid of her child getting bumps, bruises, scrapes and even broken bones if these things helped him find his way in the world. Most parents of blind children, by contrast, are afraid to let their kids experience this pain; they want to protect their children from suffering. According to one blind man who uses echolocation to get around, this desire to protect their kids from suffering ends up hurting them. The reporter of the story kept saying that the parents’ love gets in the way of their blind child’s ability to overcome their disability. But I disagree. Maybe fear and ignorance get in the way, but not love. Because love doesn’t always mean protecting children from pain and suffering—not when pain and suffering would help us grow and become everything we’re capable of becoming. God our heavenly Father loves us perfectly, which means he loves us enough to let us experience pain and suffering sometimes. Because it’s good for us. Anyway, I hope you’ll listen to Daniel’s story. It’s astonishing. As you may know, I’m currently preaching a sermon series on the Lord’s Prayer. I preached a similar series five years ago—a lot of water under the bridge since then—and used a book on the Lord’s Prayer called Lord, Teach Us, by Will Willimon and Stanley Hauerwas, as one resource. As I’ve revisited this book—on the other side of my “evangelical reawakening”—I find that I’m far less sympathetic than I once was with both the book’s tone and its substance. Don’t get me wrong: Like the good Candler graduate that I am, I believe that the gospel should liberate people in the here and now, not just in the sweet by and by, and that the Church should take the lead to make the world a more just place, as it has for two millennia. But even if the most oppressive nations on earth were suddenly as egalitarian as, say, Sweden, these nations would still need Jesus to save them from their sins. The Swedes still need Jesus! 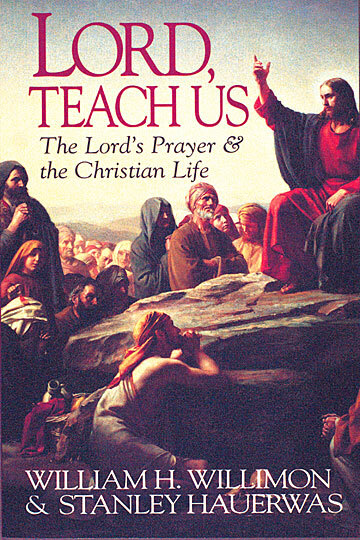 † William Willimon and Stanley Hauerwas, Lord, Teach Us: The Lord’s Prayer and the Christian Life (Nashville: Abingdon, 1996), 63. Are natural disasters proof against God? He enunciates, you’ll notice, a version of the logical problem of evil, based upon so-called natural evil in the world… But what our listeners, I think, need to understand is that this version of the problem of evil (that it is impossible for God to be all-powerful and all-good) is rejected by virtually everyone today – both theist and non-theist – because it lays upon the non-theist so heavy a burden of proof that nobody has been able to sustain it. The non-theist would have to show that it is impossible logically that God could have morally sufficient reasons for permitting the evil and suffering in the world that is due to natural disasters. There is simply no way that the non-theist can justify such a claim. 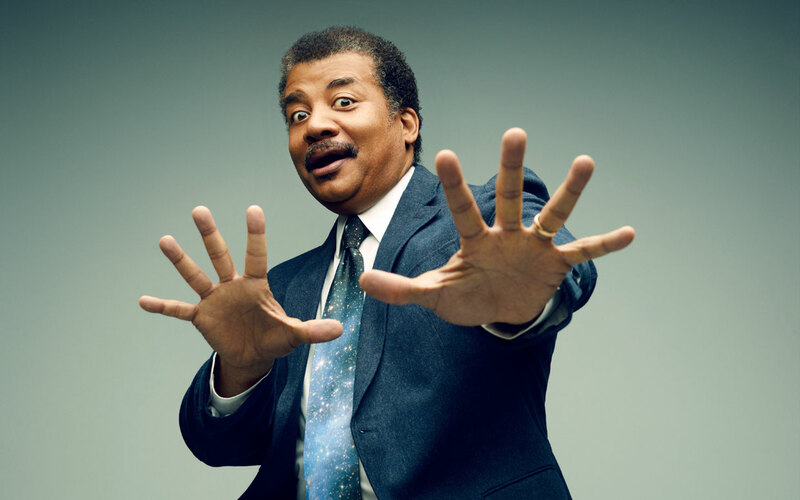 He can say, as Tyson does, Well, I don’t see why these things would occur. But that doesn’t even take one step toward proving that it is logically impossible that God could have morally sufficient reasons for allowing these disasters to occur. He is assuming that what ought not to be ought not to be permitted. That doesn’t follow. I think that there could be cases which one permits evil or suffering to take place because even though that event is evil or bad there can be some greater good that would come out of it, or the prevention of some even worse evil in the future… Say that you got a choice between either allowing one person to be shot and killed or three people to be shot and killed – you can’t do both. You can only prevent one. If you prevent the three people being shot and killed, you’ve permitted the one person to be killed. But that doesn’t mean you’ve done something evil. you did understand [God]. How are you saying this is the handiwork of God? You are doing God’s work. God wants you to do this. Somehow you know God’s motives every other way, but when a quarter-million people get wiped out, God works in mysterious ways. Why do you even claim to have access to God’s mind in some context and not others? Just admit you have no clue and get on with life. That is how I look at it. I would remind Tyson that inasmuch as we “have a clue” about God, we do so because we believe that God has revealed something about himself to us. That’s why, for example, we can assert even in the face of tragedy, evil, and suffering that God is good. But, as Craig points out, it shouldn’t surprise Tyson or anyone else—based on logic alone—that we are unable to say why God permits something to happen. We believers aren’t being irrational; we’re merely recognizing the limits of our finite minds. So I would simply say that in going through life we don’t have the ability to make any kind of guesses about why things happen in the world. We are just not in a position to make those kind of judgments. Rather, our responsibility, I think, as the book of Job emphasizes, is to trust God and live faithfully for him through the circumstances that we go through. Maybe some day in heaven looking back we’ll see the reasons why good and bad things occurred, but while we are here in the midst of life, that knowledge is simply not within our grasp. 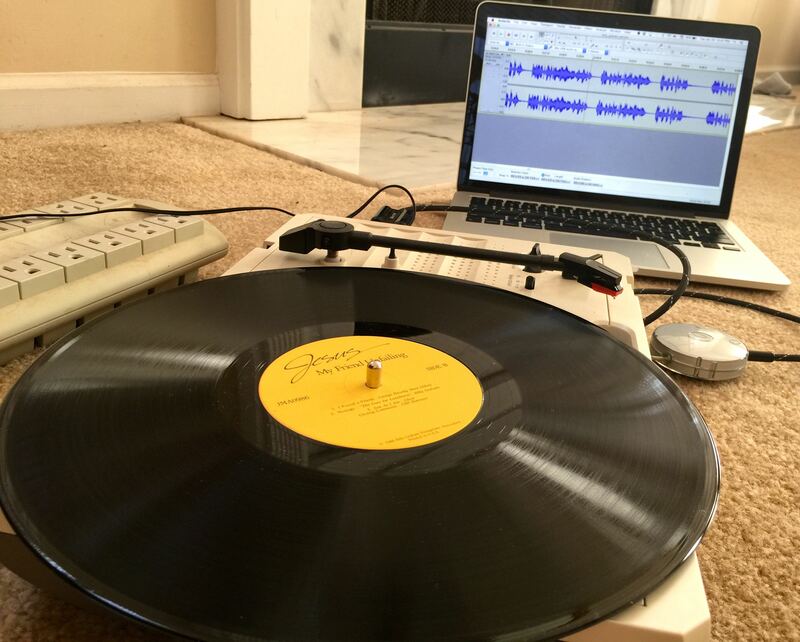 In honor of Billy Graham, a hero of mine, I’m digitizing some of his sermons from long out-of-print records and making them available as MP3s. 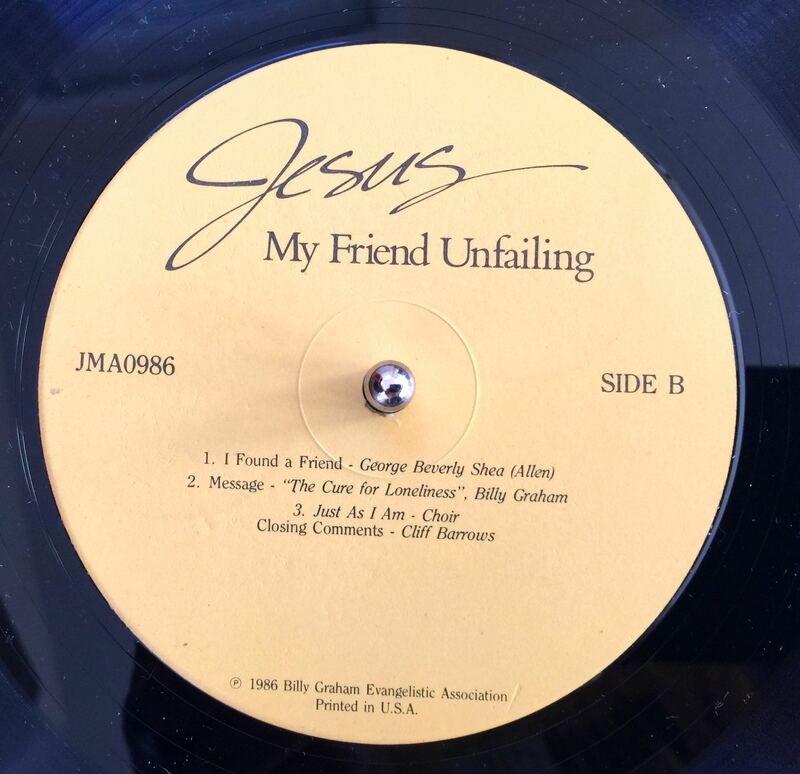 This sermon is found on an LP called Jesus, My Friend Unfailing from 1986 (Billy Graham Evangelistic Association, JMA0986). In today’s sermon, from a Crusade in Washington, D.C., in May 1986, Rev. Graham preaches about loneliness, whose root cause is sin. We are born in sin, the Bible says… The seed of sin started at the moment of conception. And it goes on and on and on and on, until, tonight, in the sight of God, you are a sinner. And the word “sin” means lawbreaker. You’ve broken the laws of God. And if you’ve broken the laws of God, you are under the sentence of eternal death. All that’s implied in the word eternal death—all that’s implied in judgment, all that’s implied in hell—is yours. Unless, of course, you repent of you sin and turn to the cross, where you can find wonderful forgiveness. Because, you see, God is a God of love, a God of mercy. He loves you. He has the hairs of your head numbered. He knows all about you. And he wants to come into your and take away that loneliness. And he wants to come into your life and give you new hope and new assurance, no matter what your condition is! 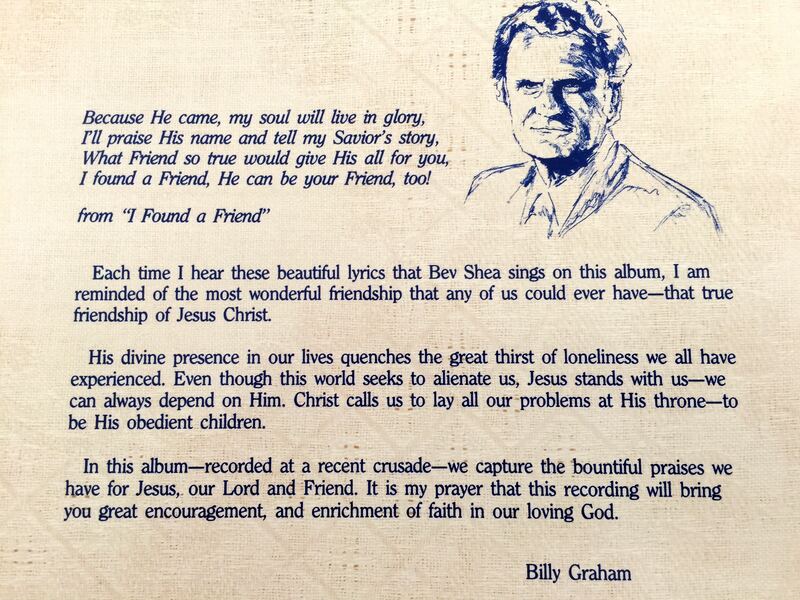 From the back cover of Jesus, My Friend Unfailing. He says that Christ, in his atoning death, experienced loneliness more severely than anyone. Even at the end the scripture says all the disciples forsook him and fled. The crowd who on one day were shouting “hosannas” and throwing palm leaves down deserted him, and began to yell, “Crucify him! Crucify him!” What loneliness he must have felt! Then they hung him on a cross, and his blood was flowing, and they taunted him, “Come down, come down, you’ve saved others. Save yourself!” And they said that, 72 thousand angels in heaven pulled their swords ready to go rescue him, and he said, “No! I love them. I’m dying for those people in 1986 in Washington, D.C. I’m dying for those people in generations unborn. I’ll stay here and bear their sins. I know they’ve committed every type of sin. I know they’ve broken the laws of God. But I’m going to bear their penalty and their punishment and take it upon myself. And the loneliness of that moment when he said, “My God, my God, why hast thou forsaken me?”—no theologian quite understands what happened there. But in that moment God took your sins and mine and laid them on Christ. And he became guilty of our sins. The loneliness of it all! For you… and for me! And how anyone can reject the Savior I do not know. Christ hanging on the cross experienced the ultimate loneliness. We also experience a kind of loneliness when we decide to place our in Christ. And then, eighthly, there’s the loneliness of your decision. You cannot depend upon parents or friends. You must make this decision for Christ yourself. And that decision means this: that you repent of sin. And what does that mean? You say, “God, I have sinned.” Will you say that tonight? Sure you will! You know you have. Then the next part of repentance is, I’m willing to turn from my sins. The word “repentance” means change your mind. Turn. I’m going in one direction in my life… I’m willing, Lord, if you’ll help me—I can’t do it alone—but I’m willing to turn and change directions. And any attempt to deal with sin apart from that will not work. There was an article in the press about punk-rock kids in England. And this lady that was writing the article says, “They’re a generation of alienated young who are going nowhere and looking forward to nothing.” I don’t know. I’d say that they’re young people for whom Christ died, and he loves the punk-rock kids, and died for them, and he would receive them and love them. To listen to the sermon, click the play button above or right-click here to download as a separate mp3 file. I was talking about the words, “hallowed be thy name,” in today’s sermon—the second part of my series on the Lord’s Prayer. Since the focus of the sermon was worship, I showed the following movie in the service at 9:00, although technical difficulties prevented us from showing it at 11:00. It’s a worship service I was part of in Nakuru, Kenya, in September 2012. I’m about a thousand times wealthier than my fellow pastors in Kenya, but, brothers and sisters, I realized that I was poor in comparison to them! And I felt my spiritual poverty most acutely when I worshiped and prayed alongside them! Honestly, I felt like a fraud! My praise was play-acting in comparison to theirs. 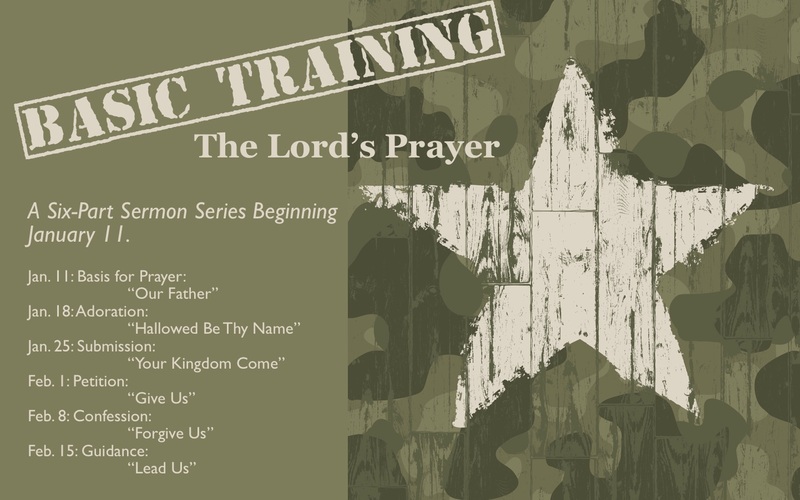 Our new six-part sermon series on the Lord’s Prayer. Our scripture begins with Jesus’ warning against praying like the “pagans,” by which he means praying as if God rewards good behavior. Instead, if God is truly “our Father,” and we’re adopted into God’s family through faith in Christ, then the basis for prayer and our relationship with God is one of pure grace. This sermon explores what it means to call God our Father. 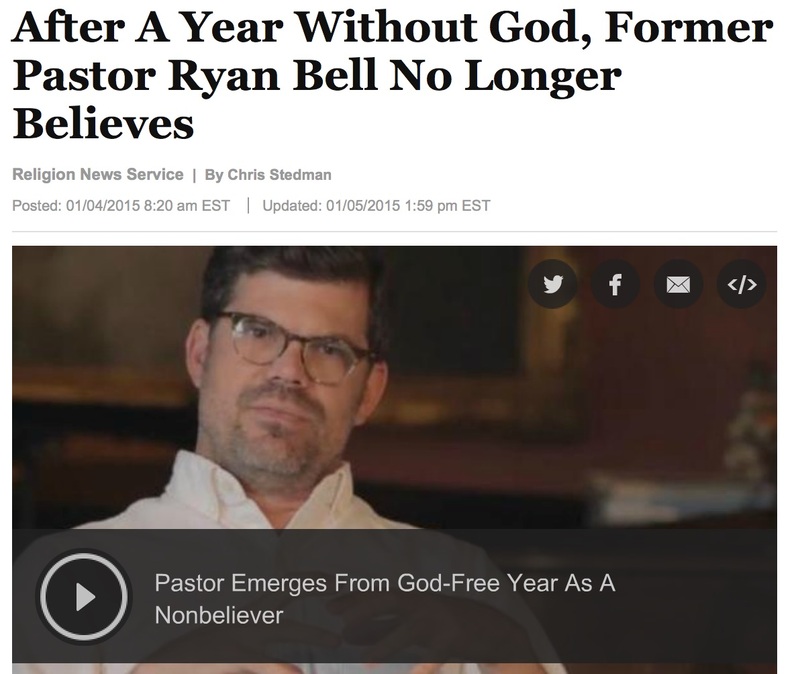 A year ago, a high-profile former pastor and seminary professor out in California named Ryan Bell made headlines by announcing publicly that he was going to take a “year off” from being a Christian and live his life as if there were no God. He said, “I will not pray, read the Bible for inspiration… I will… live life for a year as an atheist”—after which he’ll decide whether or not to become an atheist or remain a Christian. Of course, from my perspective, you can’t conduct that kind of “experiment” and still be a Christian a Christian in the first place, so I believe that Bell’s mind was already made up. Why would a Christian even need to take a year off to know what it’s like to live without God? Still, my question is, Why would this guy need to conduct an experiment to know what it’s like to live without God? I certainly wouldn’t! I mean, I’ve known days without God. Maybe weeks. I’ve gone through stretches of time when I’ve lived as if I were practically an atheist—even as I was going through the motions of church and Christian faith. Fortunately, when I’ve wandered off, God has always gotten hold of me and brought me back safely into the fold. 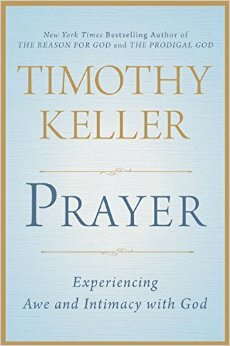 Pastor and author Tim Keller reminds us how easy it is to take for granted the greatest single resource for spirituality that we possess! His train analogy fits perfectly, as anyone who’s spent time at Hampton United Methodist Church (which sits a few dozen yards from the train tracks) can attest. I remember being startled when it passed by on my first Sunday at the church. It feels like an earthquake. Now I don’t notice it. Imagine you are, for the first time, visiting someone who has a home or an apartment near train tracks. You are sitting there in conversation, when suddenly the train comes roaring by, just a few feet from where you are sitting, and you jump to your feet in alarm. “What’s that?” you cry. Your friend, the resident of the house, responds, “What was what?” You answer, “That sound! I thought something was coming through the wall.” “Oh, that,” she says. “That’s just the train. You know, I guess I’ve gotten so used to it that I don’t even notice it anymore.” With wide eyes you say, “I don’t see how that is possible.” But it is. It is the same with the Lord’s Prayer. The whole world is starving for spiritual experience, and Jesus gives us the means to it in a few words. Jesus is saying, as it were, “Wouldn’t you like to be able to come face-to-face with the Father and king of the universe every day, to pour out your heart to him, and to sense him listening to and loving you?” We say, of course, yes. † Timothy Keller, Experiencing Awe and Intimacy with God (New York: Dutton, 2014), 109.